Although Central Union Church does not owe its existence directly to the American Board of Commissioners for Foreign Missions (ABCFM,) its connection with that organization has always been so intimate that the two have worked hand in hand in the islands. The history of Central Union Church dates back to the days of the Seaman’s Bethel Church. In 1828, churchmen in Boston had founded the American Seamen’s Friend Society to supply Bibles and religious messages to the whaling and trading ships leaving for foreign waters. In 1833, practically the only commercial interest in these islands centered around the fleet of whalers which each season filled Honolulu Harbor or anchored off-shore. That year, the Seamen’s Friend Society sent Rev. John Diell to establish a chapel in Honolulu. The growing population of the town led some to believe that it was time to leave the fold of the Seamen’s Friend Society and form a separate and self-supporting church, and by their efforts, in 1852, the Second Foreign Church in Honolulu came into existence. Worshiping for four years in the old Court House, for many years known as the store of H. Hackfeld & Co., in 1856, they built a permanent house of worship at the corner of Fort and Beretania streets and the name of the organization was changed to the Fort Street Church of Honolulu. In April 1887, Fort Street Church extended a formal proposal to unite in a new organization, and from that time until the formal union, two churches worshipped together. Selection of the new church’s name was settled by vote; the final result was Central Union 28, Church of the Redeemer 18, and Bethel Union 1. Thus, Central Union Church began its existence. The original congregation numbered 337 members—250 from the Fort Street Church, 72 from Bethel Union, 13 from other churches and 2 on confession of faith at the first service. By 1888, increased church membership made it apparent that the Central Union congregation was outgrowing the Fort Street building. Central Union owned a lot on the makai-Diamond Head corner of the intersection directly across Beretania from Washington Place, home of the heir-apparent to the throne of Hawaiʻi, Mrs. John Dominis, later Queen Liliʻuokalani. Plans for the new church were discussed repeatedly over the ensuing several years, as wishes for a “commodious and substantial church edifice” outgrew the site. Plans were completed and work begun. A special service on June 3, 1891, marked the laying of the cornerstone, placed by the oldest member of the church, Samuel Northrup Castle, and the youngest, Sophie B. Judd. Central Union’s growth in membership and consequent increase in attendance created a real problem of overcrowding at the Richards Street location. Increased traffic noise on Beretania Street and congestion in downtown increased frustration in the congregation and they decided to move, again. There was much searching for the “perfect” site for a new church building. Members even took to the air and flew over Honolulu in an airplane to survey possibilities. The site committee reported on May 26, 1920; it judged one location outstanding in all respects. This 8.3-acre parcel was part of the Dillingham estate (known as Woodlawn) at the corner of Beretania and Punahou streets, “well away from the center of town” but within easy reach of the new residential areas. The senior Dillinghams had both been members of the Bethel Union congregation before their marriage in 1869 and therefore were early members of Central Union. To design a building that would express the church’s New England heritage, the congregation retained the Boston architectural firm of Cram and Ferguson. EE Black, Ltd. was the general contractor. Seating was planned for 750 on the main floor and 250 in the balcony. The cornerstone was laid in 1922 following retrieval and opening of the cornerstone from the Richards Street church. Stone from the old church were transferred to the new one and were placed in the foundation of the new Central Union. The 1891 cornerstone itself was embedded high in the wall of the entrance. “Open Air Services” were held on the new church grounds as early as June 1922, so that the congregation could watch the construction progress and enjoy the new property. 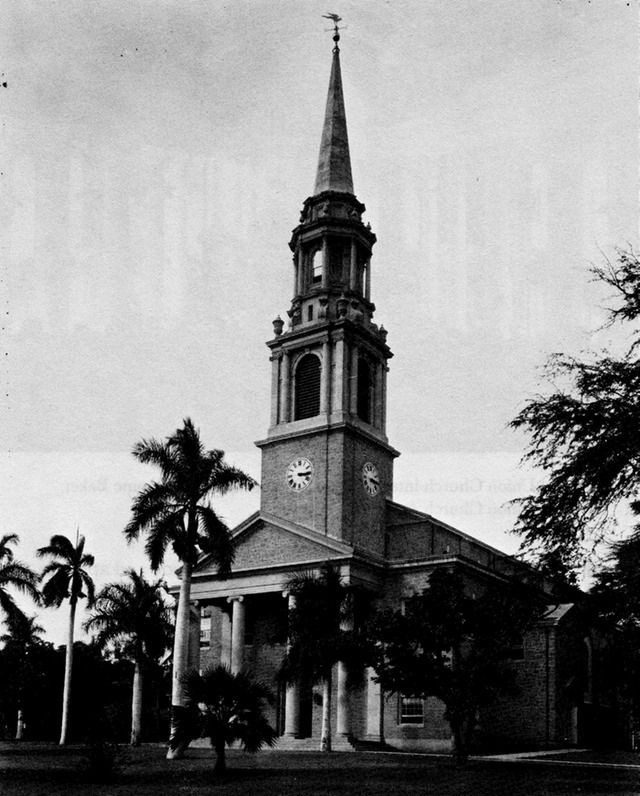 By the end of March 1924, the new building was essentially complete, and during the week of May 18, Central Union Church, also known as the “Church in a Garden”, moved to its present location on Beretania Street. The idea of a Children’s Chapel arose, “to accommodate extensions of all the services of Central Union Church, including use by all age groups for any church function which would be better served in a small, intimate setting.” The cornerstone of the Atherton Memorial Chapel was finally laid in November 1949. Information and images here came from ‘Central Union Church 1887-1988’. The image shows Central Union Church in 1924.